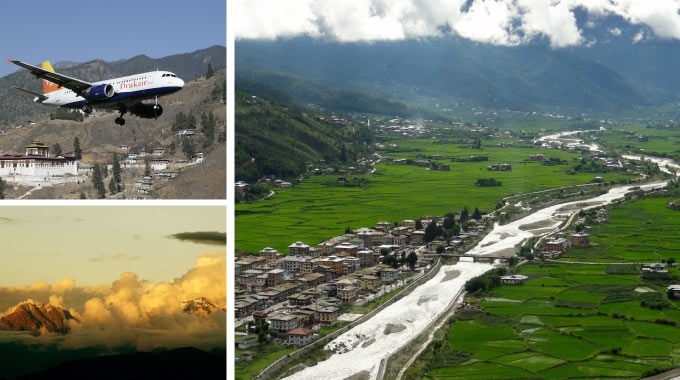 The flight into Paro (2200 m/ 7800 ft.) on the national carrier, Bhutan Airlines or Druk Air, is a befitting introduction to the spectacular beauty of Bhutan. From a window seat on clear days you can enjoy a spectacular view of Bhutan’s snow capped peaks as you approach Paro. 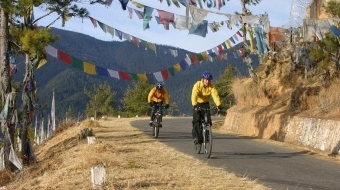 On arrival you will be received by your guide and your driver who will drive you to the capital city, Thimphu (2400 m/ 8000 ft.). 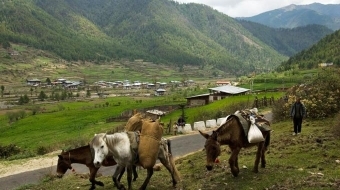 The 45 minute drive follows the rivers of Paro and Thimphu. You will have ample time to look around the city, the only capital in the world with no traffic lights. Dinner and overnight at hotel. After breakfast visit the Memorial Chorten built in the memory of the third King, Jigme Dorji Wangchuck. Drive to Motithang for a bird’s eye view of the capital city. Visit the mini zoo to get up close with ‘Takin,’ the national animal of Bhutan. Takins are a unique looking animal and are the only occupants of the mini zoo. There is an interesting story to their existence, which you will hear from your guide. Drive to Drubthop Lhakhang, the nunnery temple. Return to town for lunch at a local restaurant. 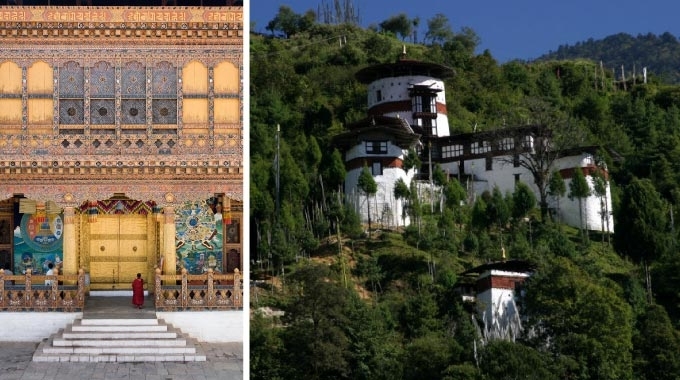 After lunch visit the Bhutanese Indigenous Hospital, Traditional Painting School, National Library and continue your drive south to Lungtenzampa, visit the Royal silversmith at work and then stop by at the Bhutanese Paper factory. 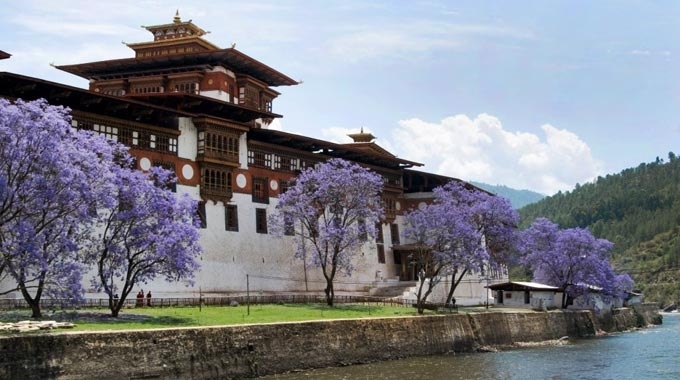 Time permitting we will visit Simtokha Dzong (fortress), the first Dzong in Bhutan built in 1624; it currently houses the Institute of Learning for Culture and Buddhist Studies. Dinner and overnight at hotel. Leaving Thimphu the road gradually climbs through a forest of pine and cedar, festooned with hanging lichen high up near Dochula pass (3,050 m/10,000 ft.). This pass offers panoramic views of the Himalayan mountain ranges. After a brief stop to catch the breathtaking views, we will descend along a series of hairpin bends to the fertile valley of Punakha (1,350 meters/ 4,430 feet). Before proceeding further to Punakha town we will hike through rice fields to Chimi Lhakhang temple located on a small hilltop. This temple is dedicated to the great Yogi in 14th century known as Drukpa Kuenley or popularly known as the “Divine madman” in the west. It is believed that this temple blesses women who seek fertility. A popular pilgrimage spot for the Bhutanese, it is frequented by childless couples and parents who have difficulty raising children. After Lunch, continue your drive towards Punakha Dzong (Fortress) situated between the two rivers Pho Chu and Mochu (Male and Female Rivers). This fortress is now used as the winter seat of the Je Khenpo (the Spiritual head of Bhutan). This Dzong had served as the capital seat of the Kingdom for more than three hundred years. Dinner and overnight at hotel. After breakfast and a drive through the Punakha Valley, we begin our hike by crossing the Mochu River and ascending a numerous switchbacks to the Namgyel Khamsum Yuely Chorten. Looking downstream, the viewpoint here affords grand views of the Mochu River Valley below. We descend from the temple and follow a well-worn path down the valley through rice fields and small villages. Along the way we are rewarded with stunning views, the terraced rice paddies providing an exotic backdrop to the river below. After enjoying a picnic lunch alongside the river, we continue our journey to Paro. Upon arrival in Paro, you will have time for walking around the town and for some shopping, if you like. Overnight at hotel. This afternoon we will visit the National Museum, housed in a unique, semi-circular shaped Ta Dzong, built in 1775. The Ta Dzong with its six floors was once the watch tower for the massive Paro Dzong, built in the 17th century by Shabdrung Ngawang Namgyal. The museum has the most extensive collection Bhutanese artifacts and history, which include, ancient crafts, wares, weapons, a collection of antique thangkha (painted or embroidered religious pictures), textiles, and stamps. The museum provides a wonderful introduction to the rich culture and heritage of the Kingdom. We walk downhill from the museum to the Paro Rinchen Pung Dzong (meaning ‘fortress on a heap of jewels’), the religious and secular center of Paro, and certainly the most dominant feature in the valley. 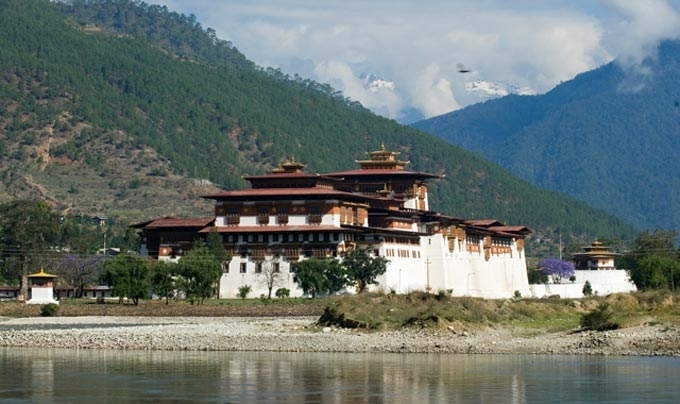 The dzong was first conceived in the 15th-century, and finally consecrated in 1646. From the Dzong, we will hike to the river and cross Nyamai Zampa, a traditional cantilever bridge. Paro options include a visit to a traditional farmhouse to lunch with the family. After spending some village time, we will visit Kyichu Lhakhang, the oldest monastery in the country. Overnight at Hotel. Farmhouse accommodation available upon request. After breakfast, your car will drop you at the starting point of the excursion to view the spectacular and famous Taktsang monastery (Tiger’s lair).The trail to the monastery climbs through beautiful pine forest, many of the trees festooned with Spanish moss, and an occasional grove of fluttering prayer flags. 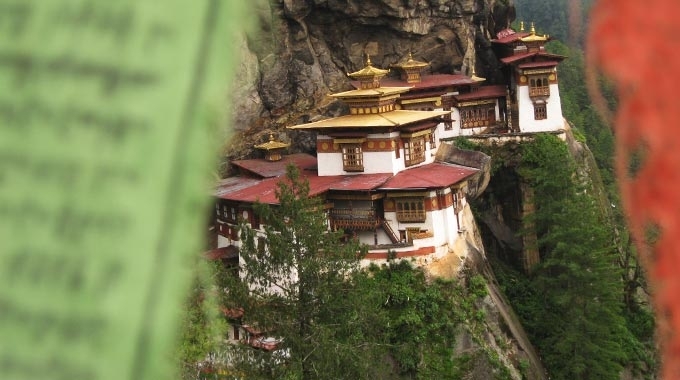 You stop at the cafeteria for a rest and refreshments and continue the hike (if not tired) for short while until you see, clearly and seemingly within reach, the imposing Taktsang monastery. Built in 1600s, this incredible monastery clings to the edge of a sheer rock cliff that plunges 900 meters into the valley below. It is believed that, in the 8th century, Guru Rimpoche, the tantric mystic who brought Buddhism to Bhutan, landed here on the back of a flying tigress to subdue a demon. Guru Rimpoche is supposed to have meditated here for three months and it is considered like a Mecca for Buddhists. Drive further up the valley to Drukgyel Dzong (the fortress of the victorious Drukpas) built in 1646 by Zhabdrung Ngawang Namgyal to celebrate victory over Tibetan invading forces and also to curtail further invasions from the enemy. The route is picturesque, and the site of dzong magnificent (from here, only two-day hike to the border with Tibet, dominated by Mt Jhomalhari). Not far from here also marks the trail head for the popular and scenic Jumolhari Trek. After returning to town, you can visit the town temple, built in 1525, to check out ancient wall paintings. Spend the rest of the evening in town. Overnight at Hotel. Morning drive to Paro Airport for departure to your onward destination.